A borrower’s gender has a significant impact on their attitude toward home loans and their student-debt load – all other relevant factors controlled, including financial management and general aversion to debt. With every $200 more in monthly student loan payments, a woman is 4.0% more likely to delay homeownership. A man of the same financial circumstances and disposition is three times less affected – he is 1.4% more likely to delay homeownership. This analysis controls for confounding variables like financial literacy and management, general aversion to debt, patience, age and more – a full list of variables is below. Despite similar attitudes to student debt before college, men and women respond differently later in life. Gender has no bearing on the demand for post-secondary education finance, according to one study, from Catherine Eckel, Cathleen Johnson, Claude Montmarquette and Christian Rojas at the University of Texas at Dallas. In other words, before college, it would seem there is no difference between men and women’s attitudes toward student loans. During college, we do see a difference emerge: men are more apt to drop out because of student debt than women, according to another study, from Laura McCloud of Pacific Lutheran University and Rachel Dwyer and Randy Hodson of Ohio State University. If their debt load is much greater than $12,426, men become more likely to bring their higher education to a halt. Women’s threshold is significantly higher, at $14,620. No one has posited a definitive explanation for this difference, but there are a number of convincing suggestions. Among them: men without a college degree face a smaller wage penalty than women. The impact of dropping out is less severe, so men feel more pressure from their student debt while enrolled. As our study shows, though, when coupled with another major financial obligation – a mortgage – it’s women who are more likely to change plans. Like we iterated above, with every $200 more in monthly student loan payments, a woman is 4.0% more likely to delay homeownership. For men, the figure is 1.4%. 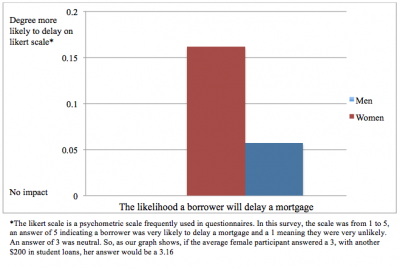 With more student debt, women become much more likely to delay a home loan than men. Let’s put these numbers in context. Our respondents were asked to what extent they agreed that student loans had forced them to delay buying a home. Their attitudes were measured on the likert scale, which rates responses from 1 to 5; a score of 5 meant the respondent strongly agreed that student debt had delayed their plans for a home loan, while a 1 meant that they strongly disagreed. Women scored 0.16 higher on the scale with an additional $200 in student loans. In plain English: they were 4.0% more likely to delay buying a home. Our study investigates the impact student loan debt has on plans to buy a home. Not surprisingly, people with more debt are more likely to delay buying a home. More surprisingly is that for some people debt weighs heavily on their plans, for others debt does not matter at all. Specifically, it is people who are financially literate and averse to debt who are affected. Also, such attitudes start young; people whose parents own a home are more likely to think about student debt when thinking about buying a home. Most notably, all of these factors only seem to matter for women. Although men and women in our sample were equally financially literate and educated, such literacy had little effect on men’s home buying plans, whereas financial literacy makes women think a lot about their student debt before buying a home. NerdWallet analyzed data with the help of Dr. Ben Ho, a professor of economics at Vassar College. NerdWallet surveyed 2,616 participants in collaboration with SmarterBucks and Student Loan Hero. A control group was surveyed via SurveyMonkey. The survey comprised 35 questions. Among them were questions on financial literacy, loan levels, education and attitudes toward homeownership.